This report covers conditions and observations made between Monday, March 17 and Sunday, March 30, 2014. The next report is scheduled for Monday, April 28, 2014. However, in the event of any significant occurrences prior to that date, this site will be updated as soon as possible. Generally clear skies and above normal temperatures graced the Sacramento Valley during the first week of the period before a series of storms brought much needed rain to the region. Total rainfall for the period, which began falling on Tuesday, the 25th and continued daily until the end of the period ranged from 0.5 inch to just under 1.5 inch. However scattered thunderstorms dropped additional amounts in isolated areas of the region. 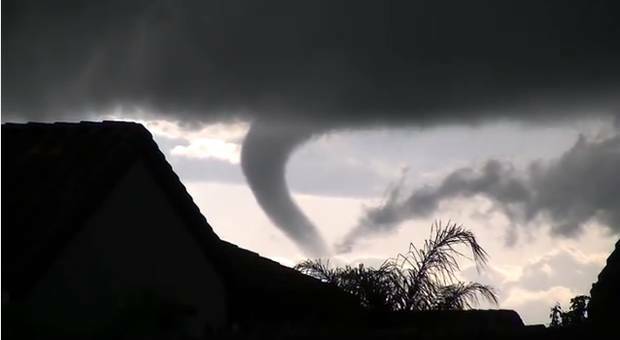 The instability that accompanied the storms also created some violent conditions. Tornado warnings were posted in several areas on multiple days with funnel clouds touching the ground in both the northern and southern areas of the region. Above normal daytime temperatures and mild overnight lows have pushed the nuts of all varieties aggressively through their jackets and promoted a rapid increase in nut size. Nuts of all varieties are now in the latter stages of the natural differentiation process wherein those the trees are unable to carry to harvest are sequestered from the flow of nutrients and are cast to the ground. Nuts will continue to be shed over the coming weeks. Growers welcomed the recent rains, hoping to replace an irrigation or two should enough rain fall and to gain additional runoff from any snow that falls in the Sierra Nevada watershed. However, the recent rains have increased the potential for fungal infections and growers are monitoring their plantings closely. In the Northern region, in spite of the supposed benefit of the areas geographic location, growers in the Sacramento Valley are also concerned about the availability of water for the 2014-growing season. Growers drawing their water from the federal Central Valley Project have been told that they will receive no water this year, forcing them to scramble to secure water from other sources where possible. As the period ended, word that water may be available from other water districts in the region has provided a degree of hope that some growers may be able to supplement supplies from their private wells. However, it remains to be seen how much may be available and at what cost. In the Central region, water also remains the prime production consideration for all in the region. 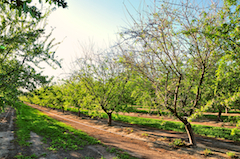 Calculations using data available from the California Irrigation Management Information System, CIMIS, show that the orchards are currently consuming approximately from 0.5 to 0.75 acre/inches of water per week. Consumption will increase in the coming weeks, amplifying the need for irrigation. While the recent rains have provided a small amount of relief, primarily by delaying irrigation or two, growers in northern areas of the region have been also encouraged by talk of their districts possibly benefiting from additional runoff needed to increase storage levels in their reservoirs. While producers in the San Joaquin Irrigation District, which serves the Escalon, Manteca and Ripon areas, are expecting full allocations of water for the 2014 growing season, those in other districts are facing significant reductions in the amount of water available from their normal sources. The Modesto Irrigation District has increased its expected allocation from 18 inches to 24 inches. Normal allocations are in the range of 36 to 40 inches per acre. Deliveries from the Modesto District are expected to start on April 9th, while deliveries from the Turlock Irrigation District are scheduled to begin April 3rd, with growers there limited to 20 inches. In the Southern region, growers in the Merced Irrigation District have been informed that they will receive only 6 acre/inches this year and that first deliveries will not be available until April 21st. Allocations from the State Water Project and the federal Central Valley Project remain at zero. However, allocations to the Central California Irrigation District, the San Luis Canal Company, Firebaugh Canal Water District and Columbia Canal Company, collectively known as the “Exchange Contractors” serving areas along the west side of Stanislaus, Merced, Madera and Fresno Counties have been restored to 40% of contracted amounts. These district’s superior water rights have provided growers there with some relief, benefitting from a relaxation in Delta pumping restrictions made possible by the runoff from the recent rains. Producers in areas facing limited supplies have been scrambling to secure water from alternative sources, where they are available. Prices for available supplies of water have already reached as high as $2,200 per acre/foot. Many with lands normally planted to annual crops will not be farming those fields this year, opting to transfer the water from fallowed lands to their orchards. Some have even mentioned intentions to rent open or unplanted land solely for the purpose of acquiring access to the land’s water allocation. Many will be dependent on ground water from private wells, particularly those in the Merced Irrigation District. Some growers have already noted impacts from groundwater with high pH levels, which have reduced vigor and caused a yellowing of the tree’s foliage as nutrient availability becomes reduced due to the elevated pH. Further south, water consumption and the supplies needed to bring the crop to maturity stand as the foremost point of concern for all growers in the region. While growers in the Central California Irrigation District, the San Luis Canal Company, Firebaugh Canal Water District and Columbia Canal Company, collectively known as the “Exchange Contractors” have been notified that they will receive 40% of their contracted amounts due to their superior water rights, growers served by the reservoirs behind the Friant Dam and Hidden Dam on the east side of the valley will receive no water this year in order to meet the Exchange Contractor obligations. Growers throughout the southern San Joaquin Valley have been scrambling to secure available water and to reinforce their supplies of water available from privately owned wells. The recent rains have provided little relief.